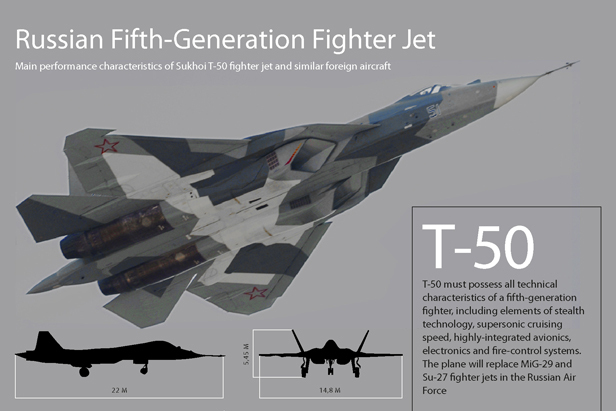 T-50 must possess all technical characteristics of a ﬁfth-generation ﬁghter, including elements of stealth technology, supersonic cruising speed, highly-integrated avionics, electronics and ﬁre-control systems. T-50 must possess all technical characteristics of a ﬁfth-generation ﬁghter, including elements of stealth technology, supersonic cruising speed, highly-integrated avionics, electronics and ﬁre-control systems. The plane will replace MiG-29 and Su-27 ﬁghter jets in the Russian Air Force.